Yeah...it's Friday! I am excited for the weekend...how about you?? We are hoping for a warm, sunny weekend since it's been rather chilly and rainy all week. If not, I will be hiding in my craft room~I guess that's no so bad either, ha? The 3D baby shoe is also from the Silhouette Store. Cute, ha? 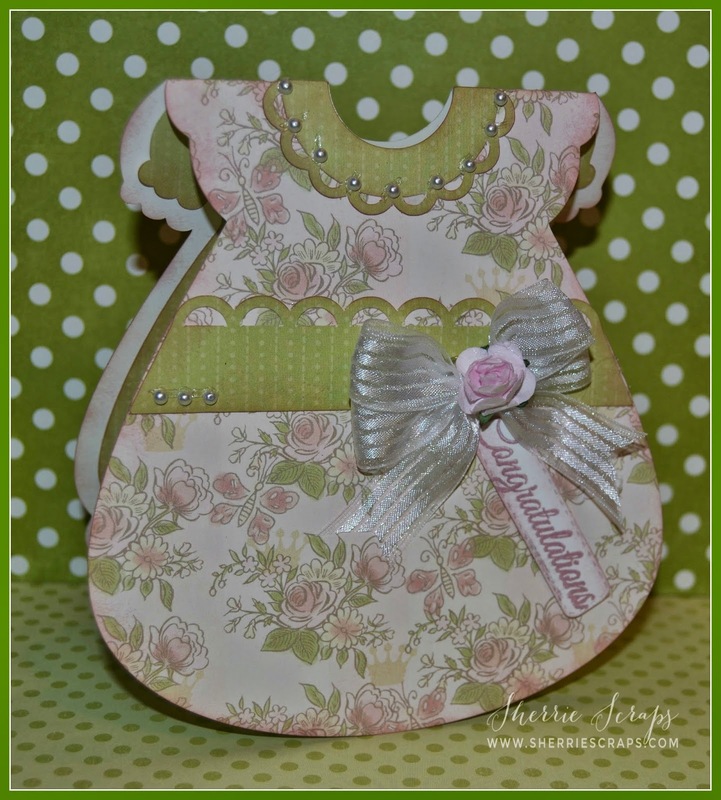 The little tag is from the Mini Tag Dies 2 and the sentiment is stamped with JB Babies and Weddings stamp set. both of these are so super cute !!! LOVE!!!!! Sherrie these turned out so beautifully I love the papers you chose! Very sweet projects! Love the baby shoe with the ribbon bow! The baby card is just as adorable and you picked the perfect papers! Have a great day! OMG We have a new baby in the family on its way in August!!!! Another boy, but I sure love your girly dress-- The pearls are precious and such a pretty pattern paper, Your bows are always perfect. I may need to buy that pretty princess stack. You are such an enabler. I am looking forward to making baby stuff again. Oh how cute, love the outfit and the shoe.... 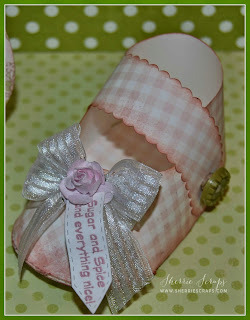 Perfect for a display on a baby's dresser... love it! Oh my gosh, Sherrie, these are the sweetest gifts!! I love the papers you used!! You decorated them so perfectly!! I just love that little shoe!! So cute!! And the shape of the card is adorable!! I love these so much!! I'm putting that paper stack on my wish list!! OMG Your card is so beautiful WOW and your Baby shoe WOW you so did two incredible creative jobs you so outdid yourself you are so talented and you sure did some amazing and fabulous embellishing jobs too. WOW your card and baby shoe are definitely to be treasured. YOU so ROCK!! OMG Sherrie, this set is just so sweet!! I just love the soft feminine papers, so pretty!! OMYGOODNESS!!! These are gorgeous! LOVING that dress and the little bootie!!!!!!!!!!! OMGOSH this is beyond PRECIOUS! LOVE the dress and I don't think you could have used better precious paper and little embellies! Then that bootie ~ ADORABLE too! WOW! I know whomever gets this should treasure it and put it in a shadow box!! BEAUTIULLY done! Well I am done stalking and I hope you have a wonderful weekend! Hope the weather isn't to bad weather! We are supposed to have some rain but lets hoe its not a complete washout! Both are so Precious!! A darling set!! Oh my goodness, so much SWEETNESS! What a darling little set - this would look so sweet displayed in a special little girl's nursery. I love the soft, pretty papers and all the darling little details - beautiful! What a cute set for welcoming a new little one! Sherrie, this is sooo cute! I had to pin it! Super cute projects Sherrie! What a darling baby gift ensemble! These are so adorable and beautiful !!! What a awesome set Sherrie!!! Love, Love this set!!!! Have a great day. Oh my gosh Sherrie these are so adorable!!!!! Totally LOVE them to pieces!!! Beautiful papers too! Thanks for linking these beauties up in our FFC! Cute, cute, cute. Love the card and those shoes are too cute! Would love to have you ink them up over at Silhouette Challenges. This is adorable, and that shoe, so cute, what a gr8t set! WOW!! These are just AWESOME!! !